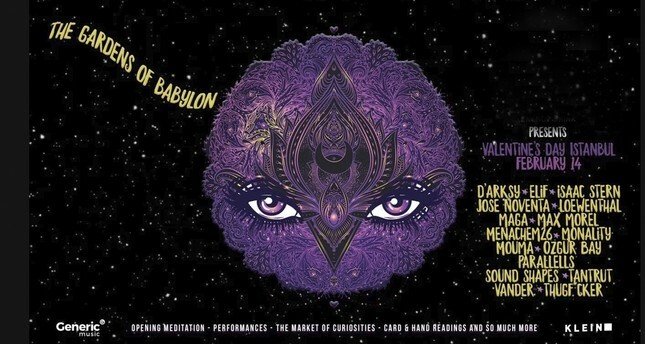 On Feb. 14 Klein in Harbiye quarter will be hosting The Gardens of Babylon. This Thursday is Valentine's Day and Istanbul will be celebrating this holiday of romance in a big way over the weekend. Whether you are single and want to mingle or already a couple that wants to splurge on a night out, there are a wide variety of options this weekend to celebrate cupid right. Referred to as the "Party Guru" Senem Selimi is also the founder of the Facebook group Istanbul Expats & Internationals Events organizations. As her title suggests, she is also a well-known party planner and regularly hosts blowout parties that are popular amongst the expat community. "Love is in the Air" will be her next party to be held on Friday, Feb. 15 at the prestigious 360 Istanbul Taksim restaurant, which is located in the historical Mısır Apartment on İstiklal Avenue and has a spectacular 360 degree view of the city, hence the name. Doors will open at 10:30 p.m. and as per usual there will be a DJ spinning tunes and a luxury raffle. Entrance is TL 50 and includes one beverage; however, it is mandatory to pre-register via the Facebook event link in order to make the guest list at the door. On Friday, Feb. 15 InterNations will be hosting a "Winter Expat Event" at the chic Shangri-La Bosphorus in Beşiktaş. Taking place from 6:30 p.m. to 11 p.m., this will be a great opportunity to meet and mingle with fellow expats and members of the Inter Nations community. Inter Nations is the world's largest expat networking platform with branches in cities all over the world and five in Turkey alone. There will be no loud music during the event and a welcome drink will be offered to guests. There will also be a discount on refreshments and dining at the restaurant hotel. While this is a member-based organization, expats are welcome to attend if they have a foreign ID, but must pay TL 60 at the door. On Thursday, Feb. 14, the six-female member Çok da Fifi Hatunlar will be performing a Valentine's Day stand-up special. This popular stand-up crew also includes the British-Turk expat Aslı Akbay, who is also the founder of English-language standup comedy nights entitled Take me up the Bosphorus. Guaranteed to get you giggling, this special performance will take place at Living Room in Kadıköy. For a romantic dinner on the evening of Valentine's Day, in a venue regularly frequented by the foreign crowd, on Thursday Feb. 14, the James Joyce Irish Pub on Balo Street in Beyoğlu will be hosting a Valentine's Day and Anti-Day dinner that will be accompanied by live music by Deep Note. The two-course menu, which has a tantalizing chicken, vegetarian and even vegan option, costs TL 75 per person and prior reservations are recommended. Le Cuistot Studio is a gourmet cafe that also caters for special dinner menu events such as this Valentine's Day candlelight dinner. Owned by a Belgian chef and expat Carlos Le Cuistot, Le Cuistot Studio, which is located in Tarabya, not only prepares amazing daily patisserie treats and meals, for take away or dining in-house, but his gourmet menu nights are also a huge hit with the expat crowd, who fill the quaint space every weekend. Guaranteed to be a special dinner on the eve, the Valentine's Day menu includes scallops and orange-glazed duck and will be a candlelight dinner, so reserve early. For the younger student expat crowd, there will an Erasmus Anti-Valentine party held at Ritim, a popular themed party spot for the Erasmus student exchange network located in the fish market off İstiklal Avenue. Conceived of by two young Turks, Pub Story is a social interactive game that has taken the country by storm. Held regularly in Turkey's major cities, Pub Story holds themed nights in venues in which all of the guests take part in an interactive game which is directed by a phone app. A great opportunity to meet new people by the masses, on Valentine's Day, Pub Story will be taking over Babylon on Thursday, Feb. 14 to host a very special Valentine's Day masquerade party. Come alone or with friends, if you don't bring your own mask, they will be handed out at the door for what is guaranteed to be a mysterious and fun event getting you meeting and mingling with everyone at Babylon, which is located in the former historical beer factory that is now the happening entertainment complex, Bomontiada. If you haven't heard of the expat musical outfit The Young Shaven, then you are in for a sweet surprise. This post-punk group has recently gotten Turkish air time with their hit 'Cig no Fire' on Radyo Eksen and are popular performers among the expat crowd. They will be performing on Thursday, Feb. 18 at mecra in Kadıköy. Undoubtedly one of the most happening places to be on the evening of Thursday, Feb. 14 will be among the bold and the beautiful at the hip Klein in Harbiye, which will be hosting The Gardens of Babylon. This international collective of DJs and mythical performers will be coming to Istanbul to host what is set to be one of the best DJ music parties of the year. Think opening meditation ceremonies, markets of curiosities and face painting to get you in the spirit to listen to some amazing music making, which will include Monality, an innovative duo by the impressive Allen Hulsey, an expat hailing from New York who has been revolutionizing music in Istanbul for years now.